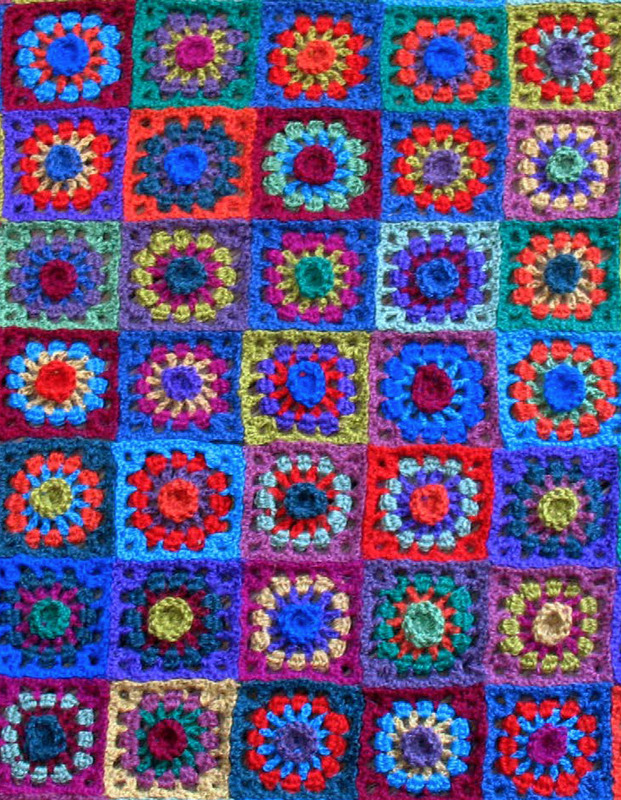 Below are variety of patterns available for purchase, these are mostly basic knitting and crochet patterns. For freeform tutorials and books, see the Tutorials page. These patterns are available as downloadable PDF’s, for you to read on your computer, iPad or Android tablet, or to print out. Once you order and pay for the PDF via PayPal, you will be instantly redirected to the download site and sent an email with instructions for downloading the file. While the payment is processed by PayPal, you do not need to have a PayPal account and can choose to pay by credit card. Prudence has been selling her ever-popular and luxurious ‘Alpacalicious’ rug kits at the Australian craft shows since 2009. Now the pattern is available on its own. Originally created using 16x50g balls of sportweight pure alpaca yarn (each in a different colour) and a 3.5mm hook, this pattern would also suit any other 8-10 ply (light worsted/aran) yarn, simply by choosing an appropriate sized hook. These unusual crochet flowers are worked directly onto buttons to create interesting and unique fibreart jewellery with enough ‘body’ to always hold their shape well. Originally designed for mini-workshops at the Aussie craft shows, this tutorial covers not only a basic pattern, but also everything you need to know to individualize the design yourself, so that you can easily create your own variations. Thin, smooth cottons work well for these brooches, but they can also be crocheted or embellished on the last few rounds using any other fine-weight novelty yarns or threads that you have in your stash. This pretty lacy scarf is great for beginner crocheters, or as an easy project for more experienced crocheters who are looking for something that doesn’t require too much concentration, to crochet on the go. 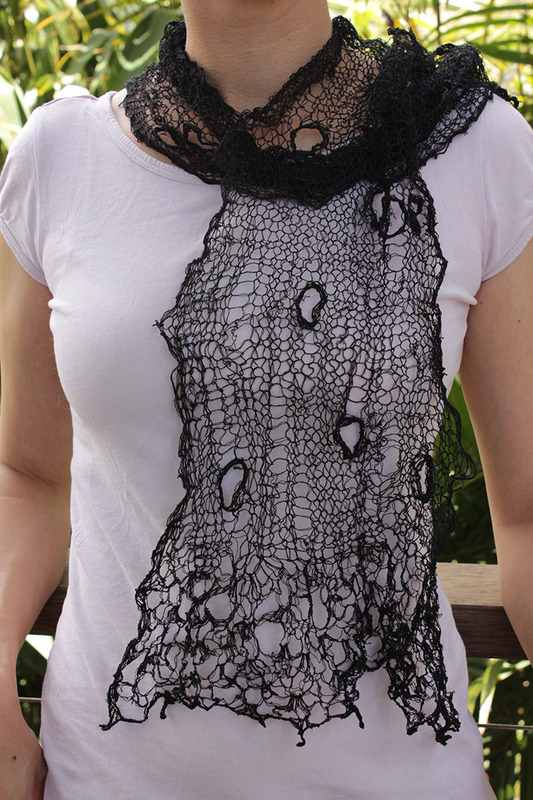 An effective but very easy pattern, it creates a lacy scarf with an overall fancy lattice effect. Tunisian crochet scarf in an unusual and interesting lacy stitch. The placement of the hook when picking up the rows of stitches, and the way that these stitches are removed from the hook in ‘bunches’ in the return rows, will create an open pattern that won’t curl at the ends. This is a pattern for a light but cozy scarf that is worked in a cellular Tunisian crochet stitch. The unusual, semi-open stitch used will trap the heat for added warmth, and it has the added bonus of not curling on the ends like many other Tunisian stitches. 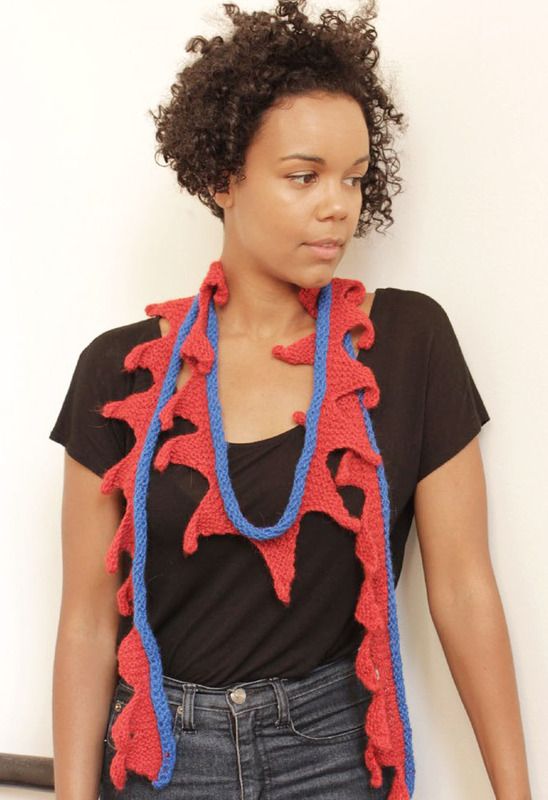 Use simple stitches to create a wearable art neck adornment, that can be made to change shape each time you wear it. 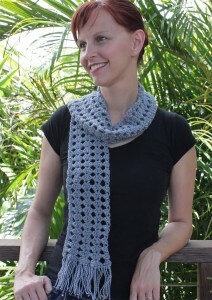 This easy pattern combines knitting and crochet together in a freeform way, to create a one-of-a-kind statement scarf using just 29g of a yarn that has a metal core. Choose from either A-20 (Silk-wrapped Stainless Steel) or A-148 (Wool-wrapped Stainless Steel), both by Habu Textiles. Once the scarf is complete, simply arrange it around your neck and then pull on the edges to create points, or scrunch it up and hold it in place with a scarf pin for random pleating; the shaping will remain until you stretch the stitches back in the other direction again. Stylish hip belt knitted in 3 colours, it has a contrasting rib section at the back, a garter stitch front, and is finished with large applique flowers and tubular ties. The sample was knitted in cotton, and took 3x50g balls of 8 ply/double knit/light worsted yarn. 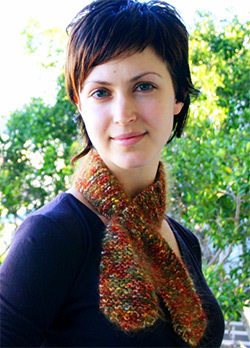 Easy knitting pattern for mix and match scarves with a ‘leafy’ saw-tooth edge. The samples have been knitted in sportweight alpaca, but this pattern is just as suitable for many other yarn types and weights, as long as appropriate-sized needles are chosen to give the finished scarves good drape. 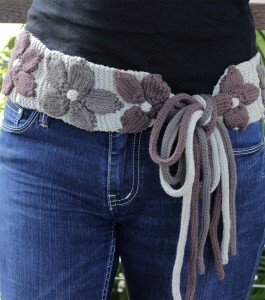 I have also successfully knitted this design using wool, silk, cotton and cotton/silk blends. The very easy pattern for this triangular design requires no sewing or crochet hook to complete – the fringe is simply knitted on at the edges as you go. The samples in the photos were knitted fairly loosely using 5.5mm needles and a lovely tweedy silk yarn from Habu Textiles (A-164). The first size uses a single 28g ball to create a neckerchief, but if you continue on with more yarn you can just as easily make a larger scarf from 2 balls, a shawlette from 3, or a more substantial shawl using 4. 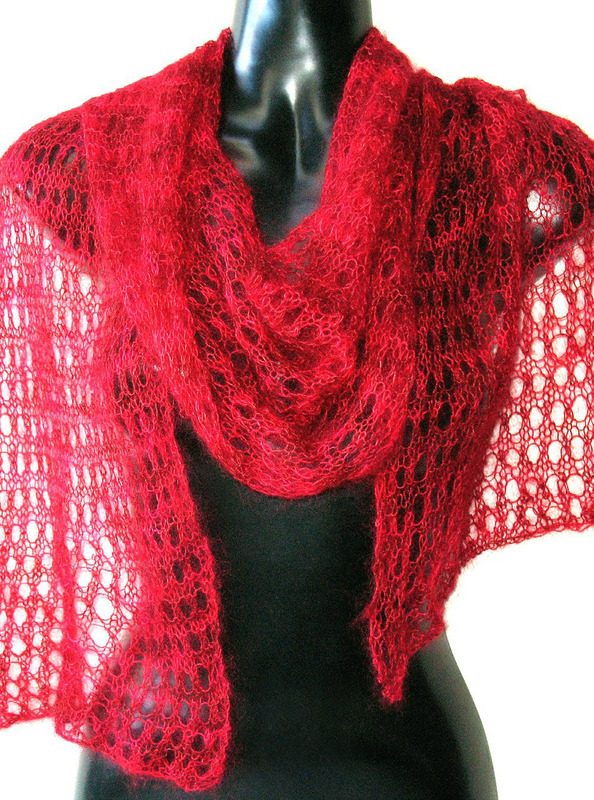 I have also used this pattern to showcase many other luxury yarns, including qiviut. Light and lacy, this easy 4-row knitting pattern is all you need to showcase the wonderful hand-painted mohair and silk ‘Haiku’ from Alchemy Yarns. Each little 25g skein measures in at a whopping 300m, and a single skein will give you a scarf measuring 30cm x 200cm (12″x80″)…or cast on double the number of stitches, and two skeins will create a shawl that is twice the width and just as long. This huge shawl only takes a total of 50g of yarn. It was created using 2x25g skeins of ‘Haiku’, a luxurious hand-painted 60% mohair/40% silk blend from Alchemy Yarns. The finished measurement of the wrap is approximately 60cmx180cm (that’s 2’x6′), and the lacy pattern couldn’t be easier – it’s just a single row repeat. 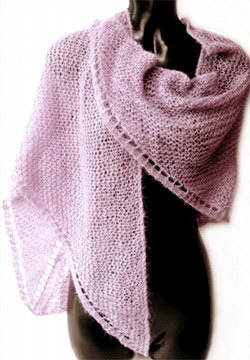 Even though it looks so delicate and airy, the yarn is extremely strong, and warm. 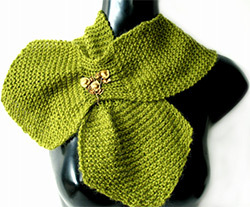 A fabulous scarf could also be knitted using just 1 skein (25g) of the same yarn. 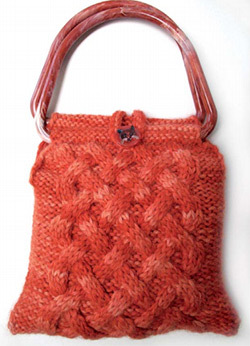 The knitted cable down the centre front of this cute little purse helps to make it something special. 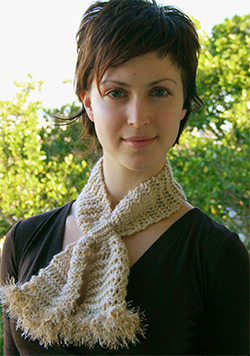 This attern takes approximately 125g (4.5 oz) of any chunky-weight yarn; the model shown is in alpaca. Using approximately 400m (437yds) or more of any fine, soft yarn, this easy, lacy, garter stitch shawl is great project for Spring. 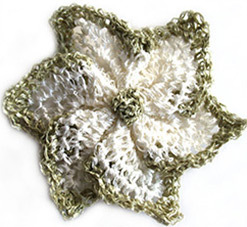 Using a stiff linen paper yarn, use this pattern to create a unique crochet flower brooch. 2 page PDF knitting pattern for a simple garter stitch neck-warmer. 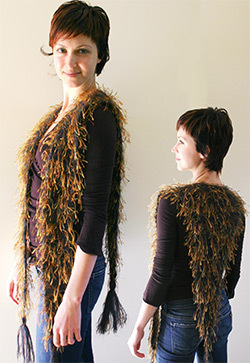 2 page PDF knitting pattern for a stunning dropped stitch neck-warmer, with ruffled ends in fringed yarn. 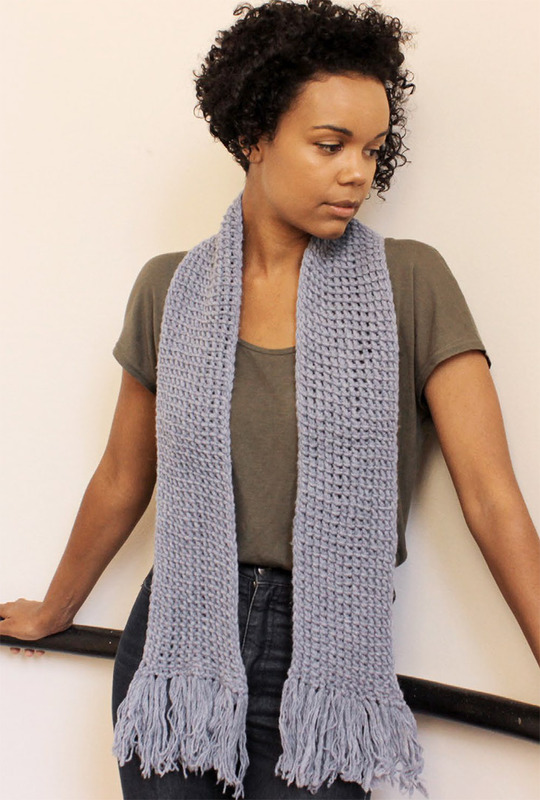 A little more complex than the garter stitch variation, this pattern uses the dropped stitch to create a soft, attractive scarf. 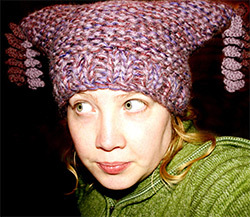 1 page PDF pattern for a basic crocheted spiral hat, plus 4 optional patterns for making your hat unique. 1 page PDF knitting pattern for a split scarf. Unusual divided scarf is quick to knit on large needles, using two different yarns held together. 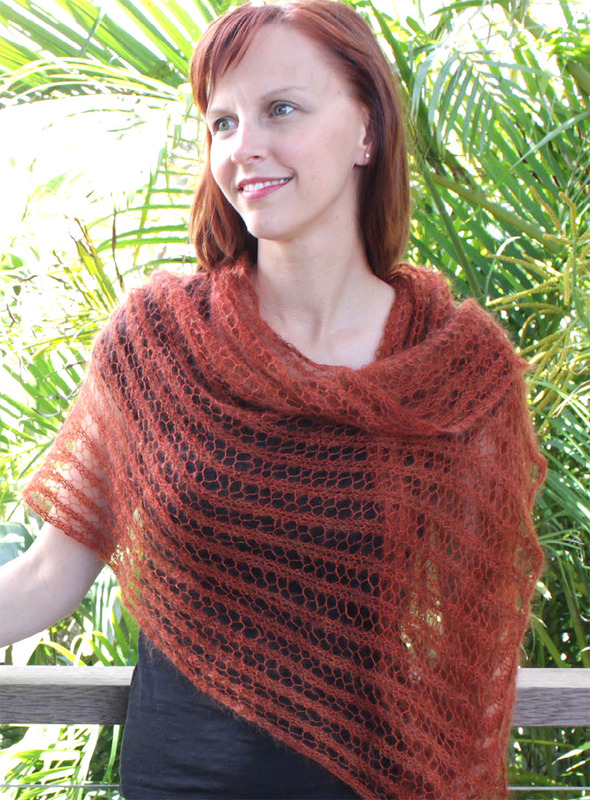 1 page PDF knitting pattern for a winter shawl. Stylish knitted shawl made in a combination of mohair and eyelash yarns uses simple shaping to help it sit comfortably on the shoulders and stay in place. 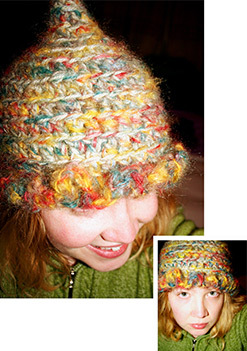 1 page PDF pattern for a cute knitted hat. This simple garter stitch hat is quick to knit using 3 balls of yarn held together. It is then embellished with corkscrews that are knitted with each of the yarns used singly. Mix & match 3 different colours or fibres to totally individualize your design. 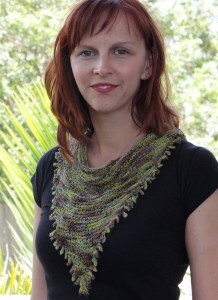 1 page PDF knitting pattern for a boomerang shaped shawl. 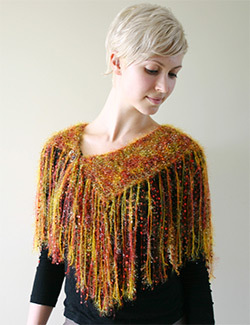 Knitted using Trendsetter ‘Aura’ together with On Line ‘Flair’ (or you could substitute a similar ‘train-track’ type yarn such as Plymouth ‘Eros’), this light weight shawl is perfect to wear to your next cocktail function. 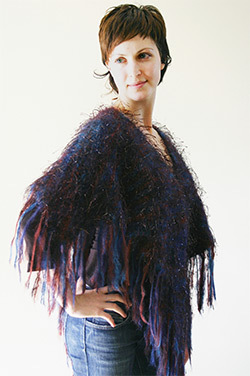 Made from sparkling yarn, the shawl can transform your daytime outfit into glamourous evening wear. When you purchase an instruction booklet or pattern from Knot Just Knitting it is licenced for personal use only. You may reproduce the actual pattern by printing it for your own records, make a backup of the file, or copy it onto multiple computers/devices in your house/workplace for your personal use. Also, any garments that you may create after following the instruction booklet or pattern may be offered for sale without the need to seek permission from the copyright holder. You may not reproduce the instruction booklet or pattern (the text & images) for use by others, offer it for sale or free download, or copy/send it to your friends. In addition, you cannot use the patterns or instruction booklets to teach a class or workshop, unless prior permission has been obtained from Prudence. You will need Adobe Acrobat Reader installed on your computer to view the PDF file. To download a free copy of Adobe Acrobat Reader, just click here.